Arai has been working on their resolution for the new year. Although, they seem to have a similar resolution year after year. In 2014, Arai continues to improve on their already perfect helmet line. The Corsair V and Vector 2 helmets have been staples in their lineup for years. 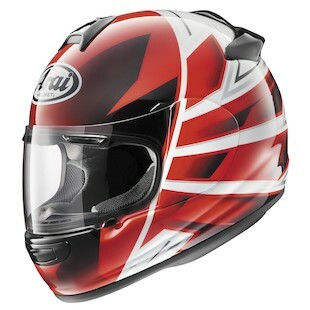 However, Arai continues to refresh their staple models with new and interesting graphics. 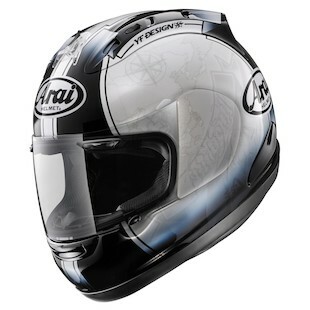 The Arai Corsair V Harada Tour graphic is simply impressive. From a distance, you see a White helmet with two Black racing stripes. You can’t appreciate the graphic until you’ve seen it up close. Deeply embedded in the Gloss White finish, is a map of Tetsuya Harada’s journey through MotoGP. The map is a detailed ghost graphic that doesn’t distract from the bold features of the graphic. Do you believe in guardian angels? The Arai Vector 2 Hawk graphic looks like a mythical creature, sent from the heavens, to show guidance and protect you along your journeys. The Hawk is a confidence inspiring halo of SNELL Certified fibers. It’s available in Red, Green, and Blue. Yes, you get to pick the color of your halo. If you’re wearing the Arai Vector 2 Contest graphic, you have one thing on your mind...competition. 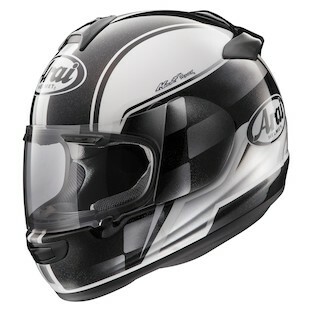 Arai has designed the Contest graphic with a checkered flag finish. However, it’s not a traditional checkered tile finish. It comes to life. You can see the windblown ripples underneath the clear coat. The Contest is available in White/Black and Red. Another successful new year for Arai. Year after year, they improve and impress. These three graphics truly show Arai’s attention to detail, and explain why they are one of the best motorcycle helmet manufacturers in the world.